The year of 2014 came as a dream to me. Whatever happened in this year, would always be remembered by me for the rest of my life. This year was very significant to bring me even closer to my real dream of being a writer. Well, he who writes is a writer but to be honest, I want to be a writer who makes an impact in bringing peace to this society. I really wish to be that person, who can bring a smile to each person who gets to read my work. A writer who doesn't make anyone cry and be hurt all the way. Yes, I write on grief too, but I am optimistic and believe everyone should be so. The writer known by a pen name, Kasak is a fitness freak, who does modelling and in his words, he is someone who, "emphasises on all experiences in life". He likes to travel and it is music that keeps him motivated. I woke up and it was daylight already kissing the walls of my room. I had slept through the night as a little child. Hugging myself with my arms grabbing my chest. It was cold in Delhi, the temperatures had dipped past Shimla, Mussorie; the hill stations where people go to witness cold. This time, Shimla and Mussorie had thought it better to visit these people. How sweet, isn't it? Yet, harsh I feel. For the people out there on the pavements and roadsides, in this biting cold. Life without colours, was like love without roses. Dreams without a motive, Heart without feelings. Human spirit was what, gave reasons to people, to smile and brighten, their day with hue as affable, and gentle as the kiss, of the growing sun every morning, towards afternoon, to dusk, and then to let stars dine. If you wait once and see, then all this seems like, a painting. As if an Artist, named God, had come to draw, with his kit of colours. Yet, reasons enough to cherish, formed for people. They worked, they ate, they made memories, with friends. They slept, they woke, towards a newer day. A hope, a dream, a magic they had, to spring to their lives. It was all mark of love, they had in their lives. They smiled, they laughed, fell in pitfalls and stood up. Went through difficult situations, and were still willful to live. It was a life, so much beautified, with human spirit. I found a new job one of those days, but it was not as good as the earlier one. Still, I was happy and content with what I got. I knew where my dream was, and what belonged to me! I was in a good mood that day, because I had a new company to work in after all those interviews I gave. The working conditions were not bad either, but the basic salary was less in comparison to what my previous company had paid me. Overall, if anyone was to see then it was a fall for me. As most people changed jobs when they found a better one, that made them move up the ladder of success in their respective fields; I had changed one, firstly because I had lost my previous job, secondly, I had no other option. As simple as that. Moreover, it didn't quite disturb me; I knew what belonged to me! Also, it wasn't purely my field, that to fall aback would hurt me. I had heard my heart and yes, my heart ruled my mind those days. Nobody's worth living for! Part-4, by Kasak! Few wishes of the unknown. A date with a 'hope'! 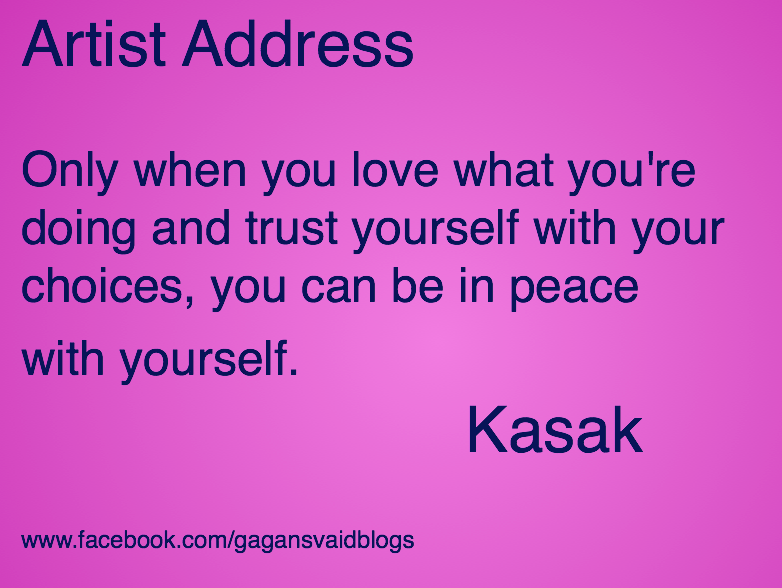 The best of Artist Address! On faces and disposition. 4! Ups and Downs, Beauty and Life! A memory of the past!